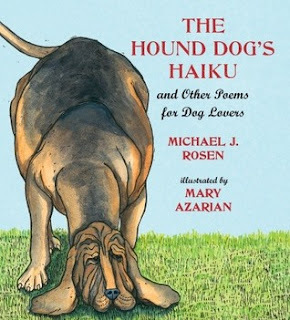 GoodReads Summary: A deft (and dog-loving) poet teams up with a Caldecott-winning artist in a fun, fetching haiku collection for anyone who's ever loved a dog. A corgi dozes with paws in the air. A bloodhound burrows into a scent. A border collie tracks a herd of cows. A wagging spaniel leaps for joy. In simple, charming haiku, poet Michael J. Rosen portrays twenty beloved dog breeds, from the pug to the Dalmatian to the golden retriever. Complete with interesting facts about each breed and illustrated with Mary Azarian's striking woodcuts, this keepsake volume is sure to set any dog lover's tail a-wagging. What I Think: I am most definitely a dog person so I was excited to read this book with haikus written for different dog breeds. There are haikus for twenty different dog breeds, from a husky to a pug to a dalmatian. Poems are fun and I think haikus can be great for teaching poetry because it gives kids a specific guideline for writing a haiku with the number of syllables in each line but sometimes it's hard to cute down the words but still keep the meaning. I worked with a teacher who had students work on haikus together. One student would write a haiku and then the other had to respond with a haiku. She suggested topics in nature like one student would write about the sun and the other about the moon, or one would write about a tree and the other a leaf. After reading this collection, kids could write from a dog's perspective and then respond from the owner, the leash, the grass, the dog bowl. Helping kids make inferences about characteristics and personality traits is something I am constantly working on with students. This book would be great for inferring how the different breeds are different physically and in their personalities. At the back of the book, there is extra information about each breed that would help students identify these qualities. Writing Prompts: Write a haiku for your favorite animal.